A dental sealant (also called a pit and fissure sealant) is a plastic, professionally-applied material that is put on the chewing surfaces of back teeth to prevent cavities. Sealants provide a physical barrier so that cavity-causing bacteria cannot invade the pits and fissures on the chewing surfaces of teeth. Why should my child get dental sealants? Since the early 1970s, childhood dental caries on smooth tooth surfaces (those without pits and fissures) has declined markedly because of widespread exposure to fluorides. By 1986-1987, approximately 90 percent of the decay in children’s teeth occurred in tooth surfaces with pits and fissures, and almost two-thirds were found on the chewing surfaces alone. Dental sealants have been shown to prevent decay on tooth surfaces with pits and fissures. Sealants have been approved for use for many years and are recommended by professional health associations and public health agencies. First permanent molars erupt into the mouth at about age 6 years. Placing sealants on these teeth shortly after they erupt protects them from developing caries in areas of the teeth where food and bacteria collect. If sealants were applied routinely to susceptible tooth surfaces in conjunction with the appropriate use of fluoride, most tooth decay in children could be prevented. 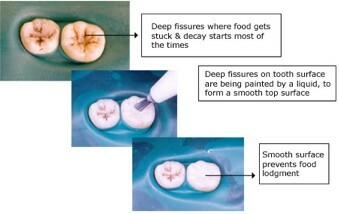 The potential to develop pit and fissure decay begins early in life, so children and teenagers are obvious candidates. But some adults at high risk of decay can benefit from sealants as well. Your dentist can tell you if you would benefit from dental sealants. A sealant will usually last 5 to 10 years…usually long enough for the child to have better hygiene habits. A child’s oral habits can shorten the life space of a sealant, stick chewy foods can dislodge and high sugar diet can still cause cavities on the exposed surfaces of the tooth. Sealants can be replaced if they are lost. Do dental sealants replace fluoride? No. Fluorides, such as those used in community water, toothpaste, gels, varnish, and mouthrinse also help to prevent decay. Fluoride works best on the smooth surfaces of teeth. The chewing surfaces on the back teeth, however, have tiny grooves where decay often begins. Sealants keep cavity-causing bacteria out of the grooves by covering them with a safe plastic coating. Sealants and fluorides work together to prevent tooth decay.